There are special traffic control restrictions in place on Leg 1(starting at the Start Line) and at Checkpoints 1 & 2. 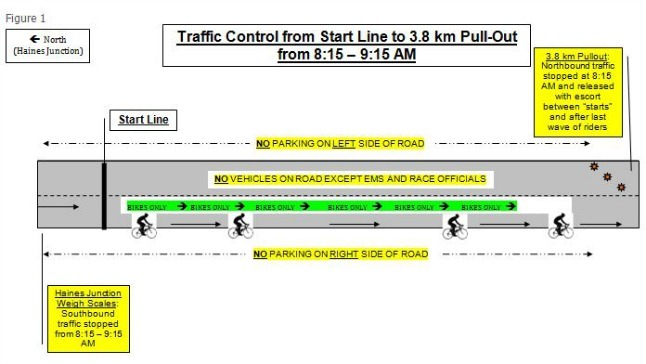 The area between the Start Line and the pull-out at km 3.8 will be “swept clean of vehicles” when the road closes at Haines Junction at 8:15 AM. No vehicles will be allowed in this section of the road. Only support vehicles should be in the pull-out at km 3.8 but you may find it easier to position your support vehicle further south on leg 1 due to the congestion at the 3.8 pull-out. All other vehicles should move past checkpoint 1 to reduce the volume of traffic on busy Leg 1. See Figure 1. There is no parking on the right southbound side from 0.5 km prior to and 1.5 km after checkpoint 1. There is no parking across from the checkpoint for a total of 300-400 metres. From 8:45 – 10:15 AM (approx), there will be one-lane alternating traffic at checkpoint 1 for 300-400 metres. Please obey traffic control people. See drawing below. There is no parking on the right southbound side before and after checkpoint 2. There is no parking across from the checkpoint for a total of 300-400 metres. From 10:15 – 11:30 AM (approx), there will be one-lane alternating traffic at checkpoint 2 for 300-400 metres. Please obey traffic control people. See drawing below. Please park well off the road so that even if you open your door, riders will not have to swing out from the edge toward the centre line. When riders are forced away from the edge of the road by poor parking, this forces vehicles passing the riders to veer out across the centre line. Pull your vehicle completely off the road before stopping and getting out. When leaving checkpoints do not speed. Pay attention, be aware of and yield to pedestrians on the road and cyclists riding out of checkpoints. Obey all traffic control volunteers, race officials, volunteers, and emergency response personnel.